Agricultural Progress in Canada East/Quebec: Problems in Measuring Relative Productivity during the Grain-Dairy Transition Period. Peter SPIERENBURG — The Spectacle of Suffering: Executions and the Evolution of Repression: from a Preindustrial Metropolis to the European Experience. DoNALD HARMAN AKENSON — The Irish in Ontario: A Study in Rural History. PHIL GARDNER — The Lost Elementary Schools of Victorian England. THOMAS P. HUGHES-Networks of Power: Electrification in We stem Society, 1880-1930. HÉLÈNE LAFORCE — Histoire de la sage-femme dans la région de Québec. JOHN E. MARTIN — Feudalism to Capitalism. Peasant and Landlord in English Agrarian Development. EMMANUEL LEROY LADURIE — La sorcière de Jasmin. ROBERT WELDON WHALEN- Bitter Wounds. German Victims of the Great War, 1914-1939. R. COLE HARRIS and ELIZABETH PHILLIPS, eds. — Letters from Windermere, 1912-1914. VERNON L. LIDTKE — The Alternative Culture: Socialist Labor in Imperial Gemany. JOHN A. MOSES — Trade Unionism in Germany from Bismarck to Hitler, 1869-1933. JOHN WEBSTER GRANT — Moon of Wintertime: Missionaries and the Indians of Canada in Encounter Since 1534. CLAIRE GOWBERG MOSES — French Feminism in the Nineteenth Century. RONALD HAMOWY — Canadian Medicine: A Study in Restricted Entry. ROBERT CHOQUETTE — L'Église catholique dans l'Ontario français du dix-neuvième siècle. ANN GORMAN CONDON — The Envy of the American States: The Loyalist Dream for New Brunswick. GEORGES VIGARELLO — Le propre et le sale. L'hygiène du corps depuis le Moyen-Âge. HOWARD PALMER — Patterns of Prejudice: A History of Nativism in Alberta. PATRICK BRODE — Sir John Beverley Robinson: Bone and Sinew of the Compact. GORDON WRIGHT — Between the Guillotine & Liberty: Two Centuries of the Crime Problem in France. GÉRALD CHOLVY — Mouvements de jeunesse chrétiens et juifs. Sociabilité juvénile dans un cadre européen 1799-1968. GERALD FRIESEN, — The Canadian Prairies — A History. 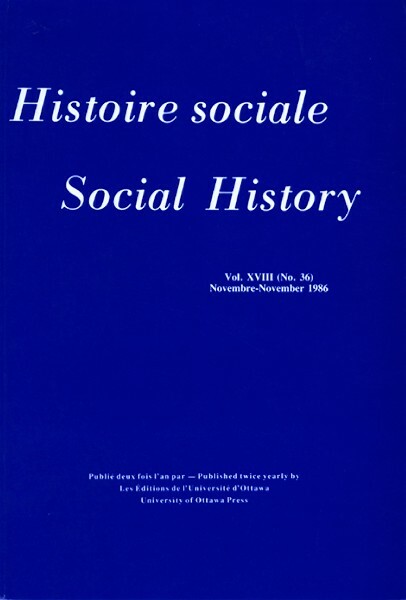 ROBERT ARMSTRONG — Structure and Change : An Economic History of Quebec.